OK, so this week was a little difficult for me. Finding an outfit I felt was true to my Classic Pretty style statement and that was inspired by one of my Pinterest looks was challenging. So, instead of trying to find just one outfit that worked, I found two outfits. Here my Pinterest inspiration look. I think about the Pinterest outfit like this: pink bottoms, polka dot top, cute heels, mix of textures. So here is my version 1 of this outfit. 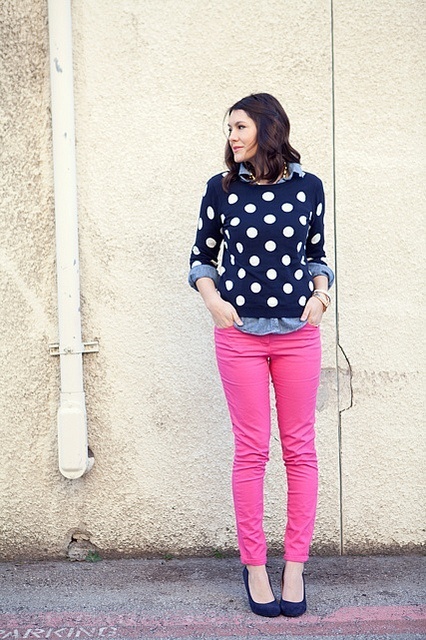 For version 2 I think about the Pinterest outfit like this: bright colored denim, polka dot sweater, collared shirt. Here is my version 2. Link up and share your Style Statement outfit!